I'm trying to get the smoothest experience possible from my setup. My two 1080p monitors are unfortunately connected through USB 3.0 to DisplayPort adapters. Things are significantly slower and delayed on those monitors. 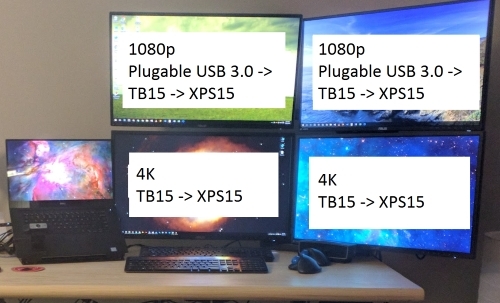 I tried connecting a Thunderbolt 3 to Dual DisplayPort adapter but I couldn't get all the monitors to work at once. Is there another adapter or setup that I could use to get better performance? What if I got a WD15 and connected it to the TB15?